Lions and leopards and rhinos, oh my! Upon arrival in Africa we got right down to business and drove from our landing point in Johannesburg to Kruger National Park for safari fun. This expansive frontier in the northeast corner of South Africa is about the size of Massachusetts with the most notable and profound difference being there are wild animals roaming around. Humans have a strict curfew of 6:30pm and are required to stay in their vehicles when outside the camps so as not to become the happy hour special. 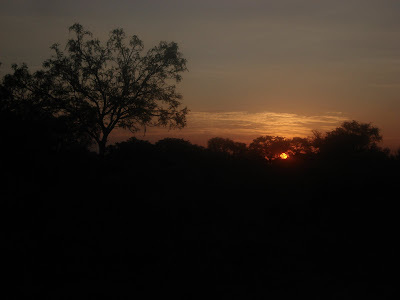 To make the most of our time we went on two camp-run safari drives and a sunrise bush walk. The walking was only permitted because we were accompanied by two very experienced park guides--who themselves were accompanied by two very large r ifles. This was undoubtedly the best few hours of our safari experience. 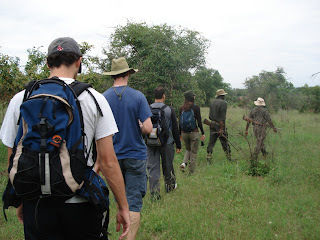 After driving through the pitch black predawn hours to the bush, Guide Opa gave us a safety briefing about walking silently in a single file line, doing everything he and Eric told us, and never turning our backs or running from a lion. Before he even finished, Eric, who had wandered from the group, motioned us over to show us a pride of lions closeby--maybe 50 meters away, definitely within mauling distance. It was terrifying. And oh so cool. We all hopped back into the safari jeep and Opa drove us for an up close and personal visit, literally spitting distance from the lounging kings of the jungle. But aside from close encounters of the absurd kind, we had a peaceful morning walk through the dew-covered African wilderness. Eric and Opa taught us enough fun facts about creatures from dung beetles to migratory birds to impress even Cliff Clavin. We had some of the most fun on our own self-drives which encompassed most of the daylight hours. Puttering along the road at a snails pace looking for animals was like taking part in a huge game in pursuit of huge game. Over the course of the four days we spent in the park we saw zebras, giraffes, hippos, hyenas, wild dogs, impalas, warthogs, baboons, monkeys, antelopes, chameleons, and ostriches. We were also fortunate enough to roll a yahtzee and spy the "Big 5": buffaloes, elephants, rhinos, and a lone leopard in addition to the aforementioned lions. The moniker was originally coined by game hunters to label the five toughest beast to kill but now serves as the African safari Holy Grail. Our private bungalow at Skukuza Rest Camp was a perfect place to come home to after safari each day. The patio kitchen allowed us to cook for ourselves for the first time in months! What better way to detox from two and a half months of Asian food than with pounds upon pounds of pasta? All washed down, of course, with delicious and cheap South African wine. Mmmmm. View more pictures from Kruger National Park here. My name is Deidre`. My husband and I love travelling in the Southern parts of Africa and we’ve been doing so for the past 16 years. 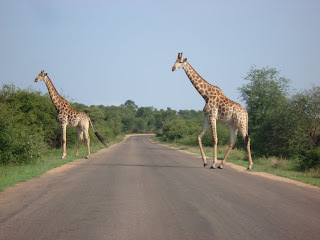 I've started a website about the Kruger Wilderness Trails at www.africaskyblue.com where I've uploaded some trail videos and photos. My husband Arno has also written some stories about our experiences if you are interested. Do you mind if I post an uplink from our site to yours? Our readers share common interests and I am sure that they’ll find your blog interesting site to visit. This course is based upon rules of probability, combinations aand studying patterns of odds and evens. or wind. To begin with download it from the connection beneath. in mind of. I say to you, I definitely get irked at the same time as people consider issues that they plainly don't recognise about. to as BARF), thoroughly research the area first as nutritional balance is essential. develop a daily Superfood Smoothie habit.